Today’s guest post is by Long Vo of GameThrive. GameThrive is a powerful Push Notifications platform for mobile games and apps built by game developers. GameThrive is absolutely free for any developers building apps exclusively with Corona SDK. So, you’ve toiled over the last several months or year making an awesome mobile game. You release it into the app stores and have gotten a large number of players engaged and playing the heck out of your game. Over time, these players will start dropping off. If you’re like most other app devs, you’ve maybe not even implemented Push Notifications or you do very little in the way of using said Push Notifications to keep your players engaged. And, just like those other app devs, you’re letting your players slip away, losing potential userbase growth and income from ads or in-app purchases. Here are 3 ways to send more effective Push Notifications using GameThrive— a free Push platform for Corona Devs. 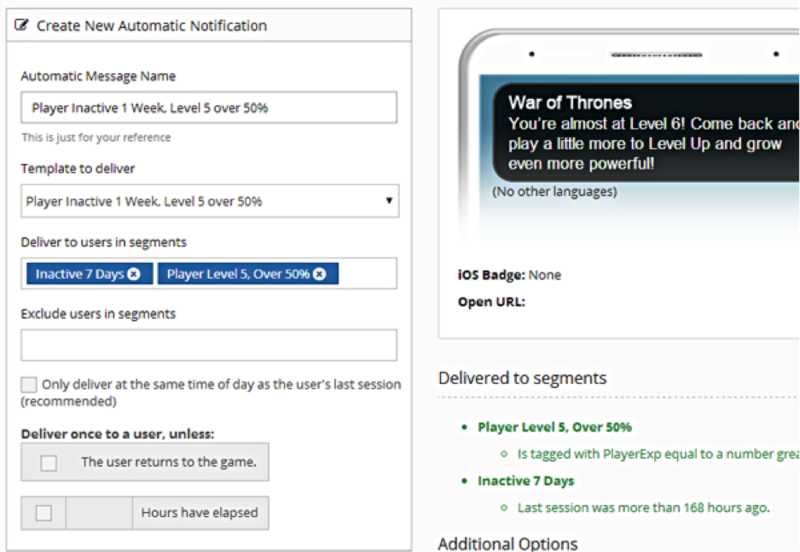 With GameThrive, you can set notifications to go out automatically when players reach criteria you set in player segments. Keep track of how active your players are. Reminders should be issued in decreasing frequency the longer they have been inactive. The trick is not to be too annoying that you risk them uninstalling your app. Your messages should also be tailored depending on how long they’ve been inactive. Using GameThrive’s Automatic Messages, you can set up a different message to go out when your players reach a specific level of inactivity. You can send a message for when a player is inactive for 4 days. Or, you can actively remind a player every 3 days if they’ve been inactive for at least a week. If your game has a leveling mechanic to it, players who invest time into leveling don’t want to waste their effort. If a player hasn’t played your game in a while, simply remind them how close they are to achieving another milestone to encourage them to come back and play. Using GameThrive’s User Tags, you can track a player’s level in the game and send an appropriate message to re-engage them. First, create a segment for the progress of your player. Once your segment is created, you can then create a Filter for Player Tags based on the Player’s EXP Level. Your final segment should look something like this. Finally, you can set up an Automatic Message using those segments to send them if they’ve been inactive for a week. Any time you add new features or make a game update is a great way to get your players to come back and re-engage with your app. On iTunes, when you release an update to your app, all your ratings and reviews get archived to that version while your new version will have no ratings whatsoever. 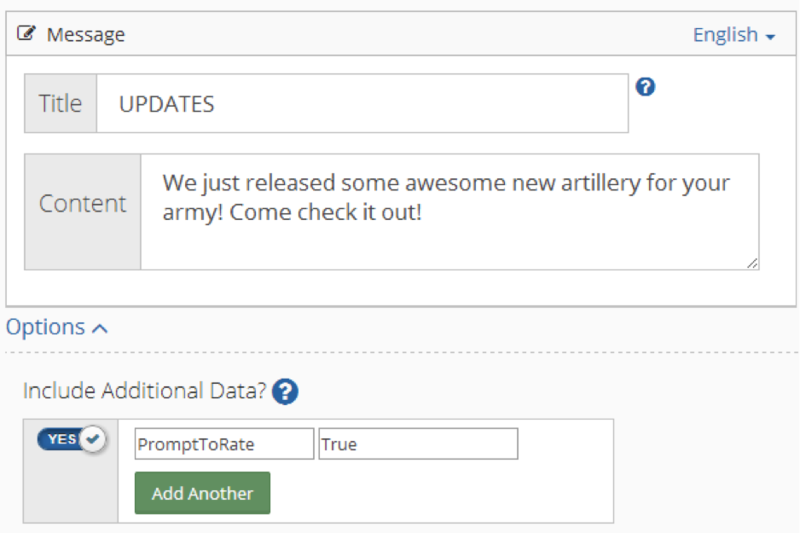 While we don’t recommend directly asking for reviews in the notification itself, you can pass metadata through the notification to present an in-game message inviting users to rate your game when they click the notification. You can include data in the Notification that your app can use to trigger a Ratings Prompt when the Notification is received. In your game code, you can create a function that triggers when the additional data is passed to the app. // Place your rate app prompt here. We hope these tips were useful to you. As a developer, you should know your audience better than anyone. 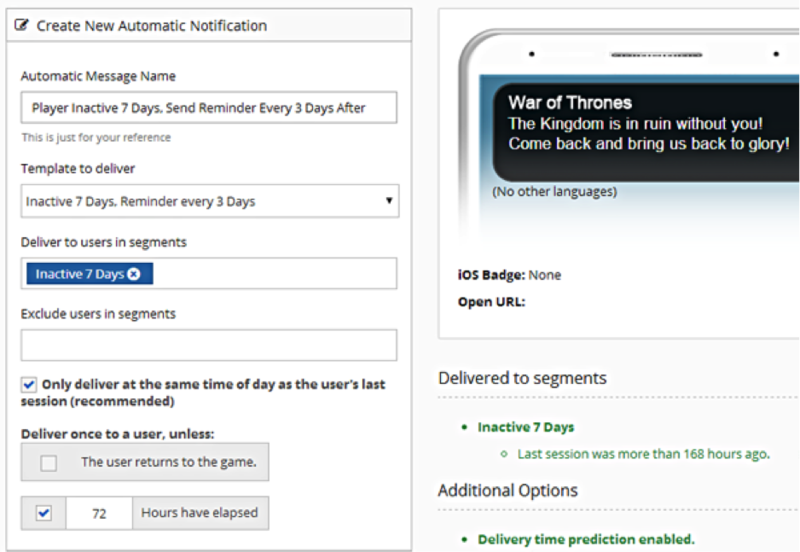 GameThrive offers more powerful ways to customize your Push Notifications for your specific needs and the above examples are just the beginning. We encourage you to try out more ways to do things and share them with the community, especially if you find out things that work for you! If you’re not already on GameThrive, you can sign up for a free account here. You can find more information on using GameThrive Push Notifications in your Corona App here.